I have a whole list of subjects to cover for Mystical Monday and one of these is a series on the Futhark Runes. This is not intended to be a historical dissertation but more to focus on the most common use of these today which is in divination or ritual work. That said, a brief bit of history is always in order. I use, and will talk about, the Elder Futhark. These are also known as Viking Runes or Nordic Runes and were in use historically between about 200 and 800 B.C.E. There are quite a few suppositions about their use but they seem to agree that they were the written language of that age for the nordic and germanic peoples. It’s called “futhark” for the same reason the alphabet was dubbed the “alphabet.” In the english alphabet, the first two symbols are alpha and beta. In futhark, the first six symbols spell out F-U-Th-A-R-K. I, personally, tend to use runes for divination or meditation over tarot or more complex graphical methods for two reasons – one is that I am just not very visual. The other is that I think it gives my subconscious more room to ponder and I’m less likely to get hung up on a visual that may or may not actually pertain to my purpose or question. Elder Futhark rune set consists of the 24 characters of the writing system and may include one blank rune, depending on the user’s preference. I don’t tend to use the blank rune but some people like it. 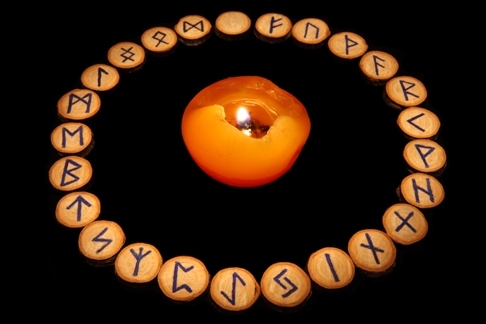 You can see a set in this photo, arranged around a candle in a counter-clockwise order with the blank rune at the top. If you want to explore the runes, the first thing you need is a set of runes but they do not have to be fancy nor expensive. For initial exploration, even some index cards with runes drawn on them with a pen would work. If you decide you like the system and want to invest more in it, you can make or buy a more durable and attractive set. Most people that use runes prefer them to be made of natural materials but whatever works for the user is just fine. I have a lot of different sets and everything from wood, to stone, to glass, to metal. I do advocate buying or making a set you really like and that “feel” good to you. If you hate the irregularity of river rock, don’t make a set from them because it will endless annoy you and you’ll find you won’t use them. I have seen rune cards but I don’t find them to have the same tactile effect. Nor do rune dice, at least not to me. I’d also advise that you pick a shape or material that allows the runes to lie in a definitely face-up or face-down position if you intend to do any casting. Marbles would not be a good bet as you’d spend a lot of time chasing them. Flat surfaces are great because you can actually write or inscribe the rune symbol on it relatively easily. Join me again next week for a post on the most basic meanings of the first six runes. This entry was posted on Monday, February 25th, 2008 at 1:00 am by Maura Anderson and is filed under Mystical Monday, Runes. You can feed this entry. Both comments and pings are currently closed.